Woman dies after UFO fireball falls from sky and causes explosion – National unexplained phenomena | Examiner.com. On Monday, September 26, 2011, a woman was killed when a UFO fell from the sky and caused an explosion in Monte Grande, Buenos Aires, Argentina. The explosion took place at 2:00am. The explosion that killed one woman also injured several others (the number of injured currently stands at eight) and caused damage to homes, vehicles, and at least one store. According to Discover Magazine, the flaming object that plummeted to the ground early Monday morning could have been a small plane, although many people will be quick to assume it was a meteor. Thus far, there is no evidence to support either of those theories. The video on the left side of this page contains an audio report on the incident from Conservative New Media (CNM). Note that the image of the explosion used in the report does not depict the actual event. To view images of the damage caused by the falling UFO, launch the video on the left. Both the audio report and the images will open in a new window. Mystery Fossils Link Fungi to Ancient Mass Extinction | Wired Science | Wired.com. Of the five mass extinctions in the Earth’s past, one stands above the rest in magnitude: the Permian-Trassic extinction, known as the Great Dying. It saw the disappearance of almost 60 percent of all families, and over 80 percent of all genera — in the ocean, that added up to about 96 percent of all species. The cause of this event, 250 million years in the past, is still a matter of debate. The most likely culprit is the prolific volcanism of the Siberian Traps— the erupted basalt still covers about 2 million square kilometers — but other events may have also played a role. Evidence for a massive destabilization of methane hydrates on the seafloor (a phenomenon described as “The Big Burp”), ocean anoxia and even contemporary asteroid impacts have all been found. A couple of recent papers in the journal Geology have brought some new information to the discussion, and may help make the picture just a little bit clearer. One source of significant mystery has been the nature of the organic microfossils that are common in rocks dated to the time of the extinction worldwide. The tiny fossils resemble filamentous colonies of cells, but have evaded positive identification. Some researchers think they are the remains of fungi, while others argue that they are algae instead. There’s evidence on both sides, but the two scenarios represent very different conditions. The fungus indicates a widespread dying of woody vegetation, while algae suggest extensive swamps forming along river systems. 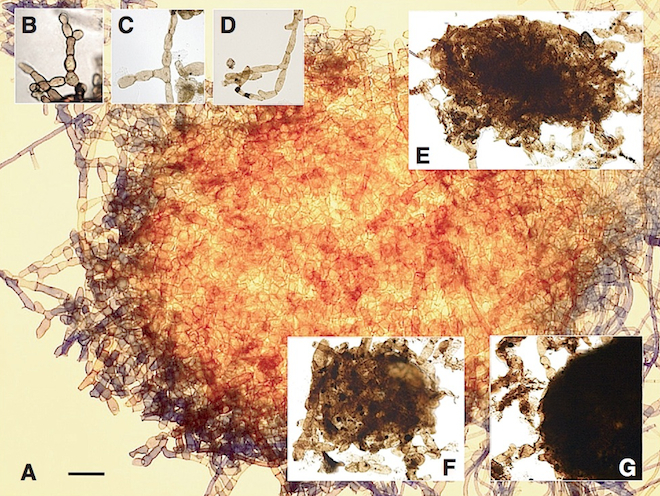 A paper published this month shows that the microfossils are almost identical morphologically to a group of pathogenic soil fungi that can infect trees. If its authors have identified these correctly, it fits in well with an overall picture showing loss of forests and topsoil. The demise of tree species is clear in pollen studies, and there is a lot of evidence for greatly accelerated soil erosion, including increased sediment deposition in deltas with lots of soil-derived organic debris. Modern studies show that drought stress and UV damage, both of which could be caused by the massive releases of volcanic gases from the Siberian Traps, can make trees susceptible to fungal infection. Separately, another recent paper has pinned down the timing of the extinction. It’s not considered to have been as sudden as the End Cretaceous extinction that killed off the dinosaurs, but the precise timeline has been tough to get a handle on, and estimates have varied. The research group looked at some marine Permian-Triassic rocks in China that recorded cyclical global climate patterns. Climate controlled the amount of terrestrial sediment that was deposited in this area, which shows up as changes in grain size through the rock layers. Using a device that measures magnetic susceptibility, they were able to precisely quantify changes in grain size across the rock layers. Together with some uranium-lead isotopic ages, they were able to pick out the orbital cycles that control climate, including the prominent 400,000-year eccentricity cycle, and use them to precisely date the extinction interval. A couple of interesting things show up in the data. For one, minima in several of the orbital cycles coincide shortly before the start of the extinction period. (Think of three sine waves with different wavelengths — at certain points in time, all three troughs will line up by chance.) That could have made for some unusual climatic conditions. Additionally, the effect of the 100,000-year orbital cycle on climate seems diminished for as long as 2 million years afterward. It’s dangerous to extrapolate to the big picture from records like this, but there’s enough there to warrant further investigation of the orbital forcings. In the end, they found that the extinction took 600,000 to 700,000 years to play out. This is consistent with the idea that several events acted in concert to destabilize ecosystems and cause the loss of so many species, meaning a significant length of time would be needed. It was simply a nasty time to be a living thing on planet Earth. Some advice for any time travelers out there — steer well clear of the Great Dying. Image: Photomicrographic comparison of fossil and modern filamentous fungal structures. A: Sclerotium of modern Rhizoctonia aff. solani, aggregated monilioid hyphae (Paul Cannon/Centre for Agriculture and Biosciences International, CABI). B: Modern R. solani, branched monilioid hyphae (Lane Tredway/American Phytopathological Society). C, D: Late Permian Reduviasporonites stoschianus, branched monilioid hyphae. E: R. stoschianus, aggregated hyphae with dominant narrow cells. F: R. stoschianus, aggregated monilioid hyphae. G: R. stoschianus, segment of small intact disk-like sclerotium. Scale bar for all images is 100 ?m. Small asteroid to whip past Earth on June 27, 2011. ScienceDaily (June 27, 2011) — Near-Earth asteroid 2011 MD will pass only 12,000 kilometers (7,500 miles) above Earth’s surface on Monday, June 27 at about 9:30 EDT. The asteroid was discovered by the LINEAR near-Earth object discovery team observing from Socorro, New Mexico. This small asteroid, only 5-20 meters in diameter, is in a very Earth-like orbit about the Sun, but an orbital analysis indicates there is no chance it will actually strike Earth on Monday. If a rocky asteroid the size of 2011 MD were to enter Earth’s atmosphere, it would be expected to burn up high in the atmosphere and cause no damage to Earth’s surface. 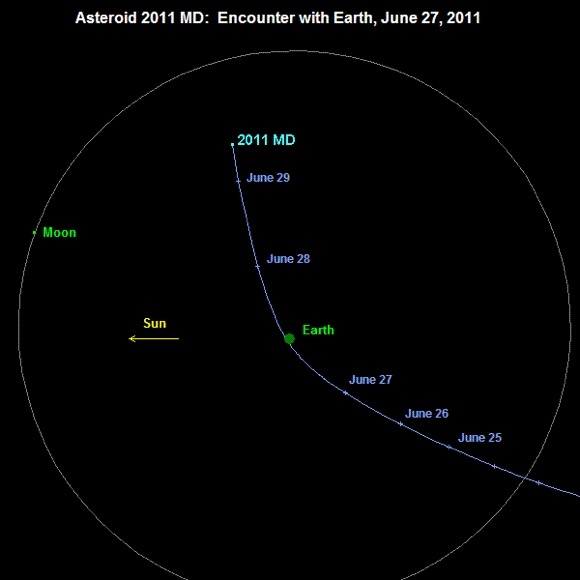 A view of the asteroid’s trajectory from the general direction of the Sun indicates that 2011 MD will reach its closest Earth approach point in extreme southern latitudes (in fact over the southern Atlantic Ocean). The incoming trajectory leg passes several thousand kilometers outside the geosynchronous ring of satellites and the outgoing leg passes well inside the ring. One would expect an object of this size to come this close to Earth about every 6 years on average. For a brief time, it may be bright enough to be seen even with a modest-sized telescope. For more information on 2011 MD and other near-Earth objects, visit http://neo.jpl.nasa.gov. An asteroid the size of a tour bus will fly past Earth today (June 27) so closely it will be beneath some of the planet’s satellites. The rock, named asteroid 2011 MD will zoom by just 7,500 miles (12,000 km) above the planet, making a sharp turn forced by Earth’s gravity before winging off into space again. The flyby will occur at about 1 p.m. EDT (1700 GMT). There is no risk of an impact, NASA scientists said. The space rock, estimated to be between 29 to 98 feet (9 to 30 meters) wide, is likely too small to survive a plunge through our atmosphere anyway. An asteroid this size, if it were mostly stony, would break apart and burn up before hitting the surface. Iron-heavy space rocks are better at surviving the fiery entry, however. Either way, calculations show that asteroid 2011 MD will make a dogleg shift in its trajectory and scoot on by. At closest approach, the asteroid will be above the coast of Antarctica. It will be well below geosynchronous satellites, which orbit 22,236 miles (35,786 km) above Earth. Experts say there is little chance the rock will hit a satellite, simply because of the vast expanse and relatively small number of satellites. The asteroid will remain well above the orbit of the International Space Station, which flies about 220 miles (354 km) above Earth. Objects the size of 2011 MD usually make close Earth passes like today’s event every six years or so, NASA estimates. However, not all of them are discovered. This rock was discovered June 22. The closest recorded space rock pass was made by asteroid 2011 CQ1, which came within 3,400 miles (5,471 kilometers) of Earth on Feb. 4 of this year. Asteroid 2011 MD will be likely visible in medium-sized telescopes by experienced observers who are able to find and track a moving object. Even NASA doesn’t expect to see much, however. An asteroid the size of a bus and massing 600 tonnes is barrelling through space toward planet Earth at terrific speed as this report is written. Astronomers say there is no chance that the object, dubbed 2011 MD, will strike our planet but it will corner sharply through our gravitational field and descend to just 7,600 miles above the surface. Thus, if you were standing beneath 2011 MD‘s point of closest approach the speeding asteroid would be closer to you than the other side of the planet is: closer than Australia is to someone in London, for instance*. In fact, as 2011 MD is expected to reach its lowest point this evening above the South Atlantic, only residents of the Falkland Islands and passing mariners will be beneath it (and it will be nearer to them than Japan is, as well as being much nearer than communications and TV satellites in geostationary orbit). According to NASA the hurtling space boulder is “5-20” metres across and masses something on the order of 630 tonnes. If it were to strike Earth – which it won’t – it would release energy equivalent to a measly 10,000 tonnes of TNT exploding. Even this would be entirely within the upper atmosphere: 2011MD isn’t big enough to avoid burning up on its way down, there would be no surface impact. *For our non-British readers, simply substitute the relevant Antipodean region as may apply to you.